Grab an amp that's easy to carry and packs the sound tools you need. Order today. I recieved this amp about 2 weeks ago and, I couldn't have been more satisfied. It is hard to believe that such a sound could come from an amp that small and lightweight but hearing is believing! My son and I are putting together a duo, he will be on bass and I will be on guitar and vocals. So far our rehearsals have been outstanding, especially using this amp. It has the perfect balance for vocals and instruments and, super effects built in. I'm glad that I went with the Artist at 120w just for the sake of headroom, if I've learned nothing else in 40yrs of playing music I've learned to always have plenty of power to spare in an amp just for the sake of a good clean sound. I really cannot praise this amp enough, I'll just say if you're in the market for an acoustic amp seriously check this one out, I did and,thats why I own it now. .This amp is very easy to get a good sound with. I was able to get great sound with my guitar, stand-up bass and vocals without even reading the instructions. I'm not familiar with the anti-feedback and phase functions but it hasn't been a problem. I did like the graghic explanation of notes on a guitar that are likely to cause feedback problems. The ipod jack in the back makes it easy to play canned music on my breaks. The stand-up bass has a Shadow pick-up that I plug into a tiny Fishman pre-amp and then into the Loudbox. Best sound EVER from this instrument. I wish Fishman made a cover or case for the Loudbox. The knobs are vulnerable so I'm having one made. The reverb is warm and natural...I don't feel like I need any add-ons to get the vocal sound I want. I needed an amp that I could play guitar and stand-up bass through, and also sing. I usually play in small venues(wine bars, restaurants, public markets, etc.) This amp is perfect for me. Very light weight,simple to use, and great sound. It's plenty loud for my purposes. So far so good. It has some fearures I may never use, but seems to be very well made and looks classy. I wanted to pay about this price for an amp I could play AND sing through. I researched it quite a bit and I'm happy with my choice. .I would highly recommend this amp. I wanted an acoustic amp to play my Taylor 710ce through on stage so I began the search with all the big names Fender, Marshall, Roland, etc. After comparing features vs. price I settled on this little gem. I like the fact it has two separate effects(one footswitchable), 3 line outs, separate effects loops for each channel, aux input, and XLR inputs on both channels. I would have given it a 10 but Fishman decided to put 24V phantom power instead of 48V. Why? Most condenser mikes require 48V. Not a deal breaker though. Another thing is I wanted a footswitch but did not know which one would work with this amp so I had to guess. Fishman doesn't make one that I know of. Fortunately, I got it right on the first try. I bought the Ibanez IFSX2 Tone Blaster Two Button Footswitch and plugged it in and it worked perfectly. It was also one of the least expensive here at Custom Guitars Friend. 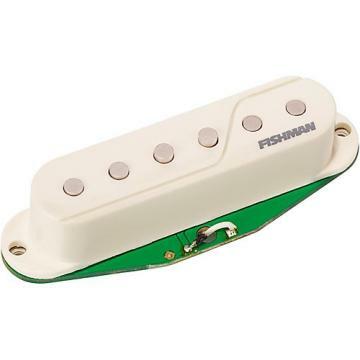 I've only had it a month but it seems to be built very well, and the Fishman reputation is very good. Used it on stage and worked flawlessly. When compared to some of the other amps, this is a graet value. .This amp is amazing, small in size and with only one 8" speaker the fullness of the sound is surprising. It has lots of low end and with 120 watts it can fill a fair sized room. I play at small venues and love not only the guitar, but also the vocal sound. The feedback control does it's job although sitting close to the amp is sometimes a fine line of adjustment to still achieve that big bottom full sound. I also like the extra input on the back which has it's own volume control, sometimes my Grandson joins me and he plugs in there. I am 66 years old and still playing about 115 gigs a year, on that note I would say that the 25 LB. weight is so appreciated. I am very selective in what I choose in equipment, it has to have a good quality sound and still be portable and affordable. It's not cheap, but I feel if your music is worth it, if you are worth it, then it's money well spent. .I purchased this Fishman Loudbox Artist for use with my fiddles as a mic preamp, phantom power source, basic FX unit, stage monitor, and direct out to our mixing console. It is working very well for these purposes. I have the amp on a stand facing towards me, with it pointed just slightly off axis to suppress feedback from my boom-mounted condenser mic which I use to mic my fiddle. - It has phantom power (24 volt), which can be switched on and off. It works perfectly well with my AKG C535 condenser mic (the current standard for many condenser mics is for phantom power between 9 and 52 volts). The phantom power is not channel specific on this amp. When turned on, it is active on both main input channels (but not the aux stereo input, which is a very good feature). - It has two identical main input channels, with combo inputs. They will accept balanced mic level XLR connections, or unbalanced line level 1/4" connections, perfect for either instruments or microphones. They have identical controls, which allows either channel to be used with all of the features of the amp, available on either channel. - It has a third stereo aux input on the back, accomadating either 1/8" or 1/4" stereo plugs, perfect for playing MP3 music through. Even better, when the main channels are muted, this rear input is still active, which allows you to play recorded music, while your mics or instruments are muted. The only very minor down side to this is that there is no tone shaping on this aux input. - It has 120 watts of power split into 100 watts for the main driver, and 20 watts for the tweeter. I have found that the best setting for the tweeter is with the attenuator set to the halfway point. It's too bright for me with the attenuator set to full open. Since the attenuator is actually controlling the output of the 20 watt side of the amplifier, it's not just strictly "attenuating" a high pass filter (like most attenuators), but is a volume control for a separate amplifier circuit. - Another great feature is the presence of three direct outputs on the back. I use the mixed direct out (which sums both main channels and the aux input signals, and sends them out post-tone and FX controls). This sends to the board exactly what I am hearing through the amp. There are also individual pre-outs for both main channels. All the outputs are balanced XLR. Both design and execution of this product are top notch, considering the size and price I'm very pleased with it. .I play solo using acoustic and some electric guitar. I use this amp as the perfect practice amp. I use it for gigs. It worked for Coffee Shops and a 200-seat Library auditorium. You can get any sound out of it you want--from warm acoustic sounds to electric sound requiring a little crunch. I'm a vocalist so the rich vocal sounds I get from it are also very important. It exceeds my needs and expectations. If it had compression, I wouldn't even have to use any footpedals (it's a personal thing--I like some compression on my guitar sounds). However many stars the top rating is, I would give this amp one more. I don't feel this way about any other equipment I own. At first I was a skeptical that is amp would be loud enough for live applications but right away I realized this little thing can roar! For the price you can't beat the quality, sound, and the features of this this amp. When I play my Taylor 712 ce through the Fishman Loudbox it just sounds like my guitar only a lot louder! It doesn't color the sound or boost the lows or high end like a lot of other amps do in this price range. ( that's what the three little knobs on the front are for :) ) Speaking of those knobs it is really easy to get your tone dialed in, and the anti-feedback feature works great!. This amp works well for both live and studio applications. With 120 watts it has plenty of power for gigs. Having a D.I. Out (xlr and 1/4" ) for both channels offers you plenty of routing options and compatibility with the typical PA system. I've had great results in my studio using the amps D.I. out. I never really liked using D.Is for recording acoustic guitar. But the D.I. Out on this amp sounds pretty good and when used in conjunction with a large diaphragm condenser mic you have yourself a professional sounding recording!The effects are good but you are limited in how much control you have over them. I mainly use outboard gear so this really isn't that big of a deal. On the other hand the reverb does sound exceptional and is the effect you will use for the most part anyway. All In all I could not be happier with my Loudbox! Definetly the best amp in this price range with an incredible sound, and a vast amount of features. It also looks really cool! What else could you ask for? I almost forgot to mention that this is a great practice amp as well and sounds pretty good at lower volumes. With the use of the Auxiliary input (1/8" and 1/4") and headphone jack (1/4") you can turn this amp into a nice little practice rig. Great feature for all you night owl rockers. :) This truly is an amazing amp! .It sounds like your acoustic instrument (depending on your pickup system), only louder. There is also enough EQ variation to taylor the sound to fit the room acoustics. The AUX input can also be used to add a small mixer, so you can do multiple vocals here and leave the 2 standard channels for instruments. The 8" speaker and tweeter offer a surprisingly full sound and it is plenty loud. I wouldn't try to run Bass through it, but almost anything else is fair game. If you have a decent guitar amp emulator, you can also play electric guitar through it. And with the DI outs and the combined outs, there is a lot of flexibility with inputting into a PA or recording console. The thing that I would like to see improved are being able to choose which two effects to have active and being able to adjust the speed/frequency of the effects more precisely. Right now you can only choose one effect from two banks, so you can't have reverb and delay because they are on the same bank. And the chorus setting allows you to change the depth but not the frequency. So you only get chorus 1 or chorus 2, but no variation. That being said, you can add your own effects and the reverbs and delays are pretty decent in most cases. .I puchased this as a hobbyist for playing and vocals with some small gigs out. The extra power comes in handy to play at higher volumes without pushing the speakers capacity. What stands out the most is how natural the acoustic sound is. I've played many other amps and the sounds they produce are more processed. Provides a diverse array of reverb, chorus and others effects. The clean tone maintains a true acoustic sound and the effects allow the user control the amount applied to it. It's a well rounded and flexible amp. Very nice looking. This amp offers much power for only 25 lbs of weight. Amps I have had with much less power were heavier. If you're getting an amp for long term usage, this is a great value. I was searching for an amp that could handle guitar and vocals in one package. I played the Loudbox Mini at my local store and was very impressed. I opted for the Loudbox Artist for the extra power and features. It has exceeded my expectations in every way.